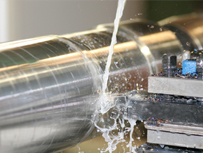 Texas Machine-Tool International proudly offers rebuild and repair services for customers with precision lathes. The technicians at TMI come equipped with expertise in repair and reconstruction of precision lathes, notably CNC lathes, manual lathes, and vertical turning lathes. These versatile machines consist of many parts which can be manipulated and retooled to perform numerous tasks. Precision lathes distinguish themselves in such facets as power, gearing, turning speed, controls, and feed gear mechanisms. Our precision lathe rebuild service exists to meet the diverse needs of customers looking for efficiency and variety in their precision lathe. These machines have been manufactured in many forms over the years, and though the industries have changed with time, the need for a productive, like-new precision lathe remains constant. The advantages of rebuilding your precision lathe with TMI are abundant. The result will be a hybrid machine, a communion of old and new parts working in high precision and efficiency. When your precision lathe is not in need of a rebuild but merely a repair, TMI’s technicians are up to the task in any situation. We can repair your precision lathe onsite, and as quickly as possible to keep your downtime to a minimum. Simply put, we know these machines well. The specialists who work with us have seen precision lathes of all makes, geared and re-geared to perform countless tasks. The turnaround will be fast and your satisfaction is guaranteed. Contact TMI today to gain more knowledge about our precision lathe rebuild and repair services. The new generation of lathes, comes with dual spindles, servomotors on all axes and fully programmable tailstocks. TMI can assist in rebuilding any section of your manual lathe, whether the bed surfaces need to be refinished or rebuild of the headstock/tailstock, we can assist you in improving the machine’s ability to build precise, accurate parts. A Vertical Turning Lathe is a turning machine in which the spindle axis is perpendicular to the ground. Vertical lathes are ideal for turning excessively large and heavy parts.